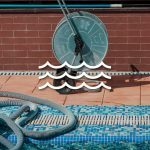 If you own a pool, you probably know better than anyone else what a hassle manual cleaning can be. Not only is it backbreaking work, but also your clean pool can be a short-lived victory with the slightest breeze. Walk away for five minutes and you might just find the entire pool covered in debris. While it can’t stop leaves, flowers, twigs, and even bugs from landing into your private oasis, the best robotic pool cleaner will remove them in a cinch. It’s time to spend less time cleaning your pool and more time doing the things you love, such as hanging out in your inflatable hot tub. 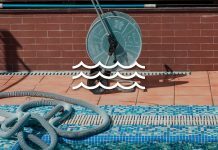 If you’re looking for an easy way to clean your pool, read on to find the best automated pool cleaner for you. 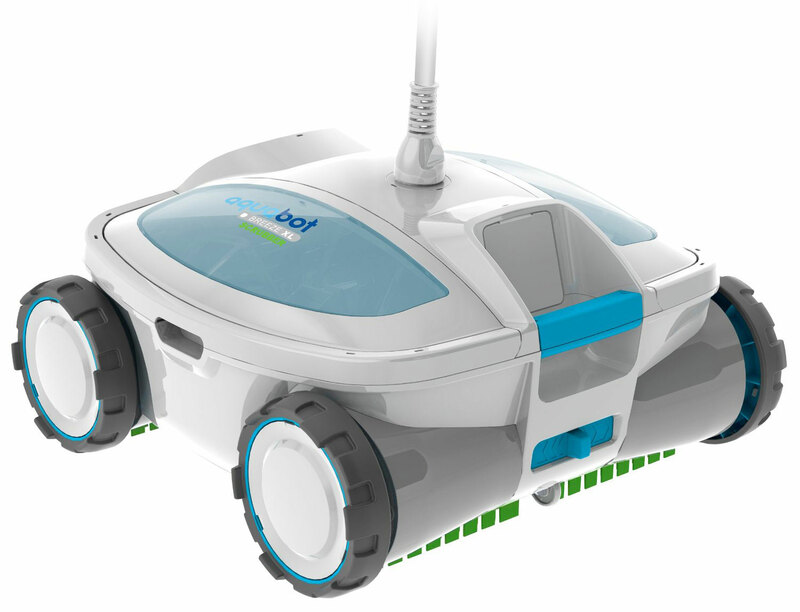 The Dolphin Nautilus robotic pool cleaner is a mean-cleaning machine. Want a pool that’s bug-free, debris-free, and squeaky clean in three hours or less? This is your go-to machine. Even better, this cleaner doesn’t hook up to your pool filter, which eliminates odds that your filter will get clogged. This model is also designed to clean walls, and will climb to the edges while working. User-friendly, this pool vacuum comes with easy to clean filters. 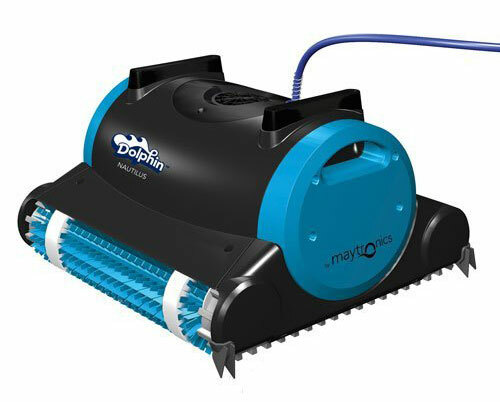 The Dolphin Nautilus robotic pool cleaner is also energy efficient and fairly quiet. If you’re looking for a great option that’s inexpensive and well made then you’ll really like this product. 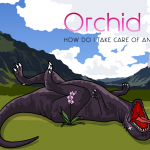 Own an above ground pool and unsure of where to begin when it come to cleaning it? Well, the neat thing about the Aquabot APRVJR Pool Rover Jounir is that it’s designed to clear debris from above ground pools. With a forty foot floating cable, this pool cleaner allows you to vacuum any sized pool, no matter the shape. What’s more, this unit is designed to get the job done in an hour or less. And the perks don’t stop there. Forgetful owners won’t have to worry about an enormous energy bill should it slip their mind to shut off this cleaner. 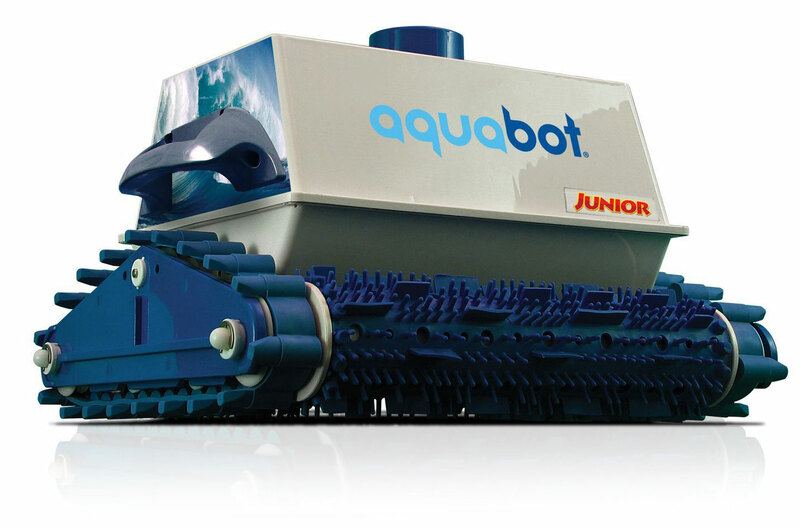 This Aquabot model features a 2-hour automatic shut off and powerful suction capacity. Even better, you don’t have to stress about a faulty motor. Upon purchase the manufacturer provides a 1-year warranty. 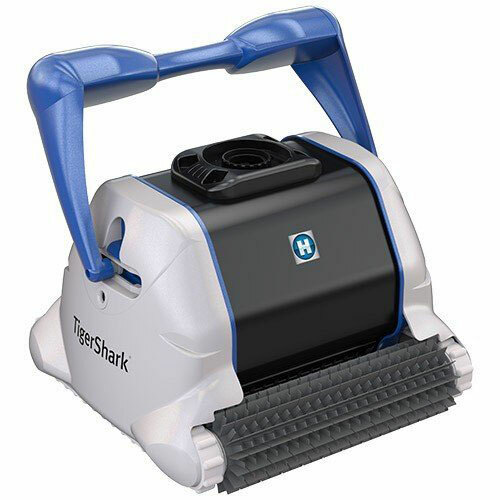 The Hayward RC99990GR TigerShark QC Automatic Robotic Pool Cleaner defines stress-free pool cleaning at it’s best. This pool cleaning robot (880) doesn’t require any additional hook up or pumps, which really saves a lot of time and hassle. What sets this unit apart from other products on the market is the 90 minuet quick clean feature; ideal for pool maintenance in between deep cleans. Using microprocessor technology, the TigerShark almost never misses a spot, and can be used for both in-ground and aboveground pools. 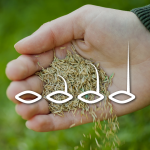 The filters are also easy to clean, making upkeep a breeze. 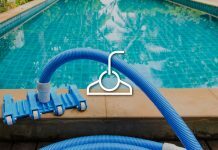 While pool cleaners can be relatively painless to use, one of the most frustrating things about using these machines is putting up with tangled wires. The trademark swivel cable on the Dolphin Triton Robotic Pool Cleaner resolves that problem. Additionally, expanding 60-feet long, the cable makes it easy for the cleaner to reach all the nooks—even in larger pools. Since Dolphin products computer operated, this model will never clean the same spot in your pool more than once in a sitting. This is the best robotic pool cleaner for anyone who wants to turn on the pool cleaner and let it run, without having to interfere. 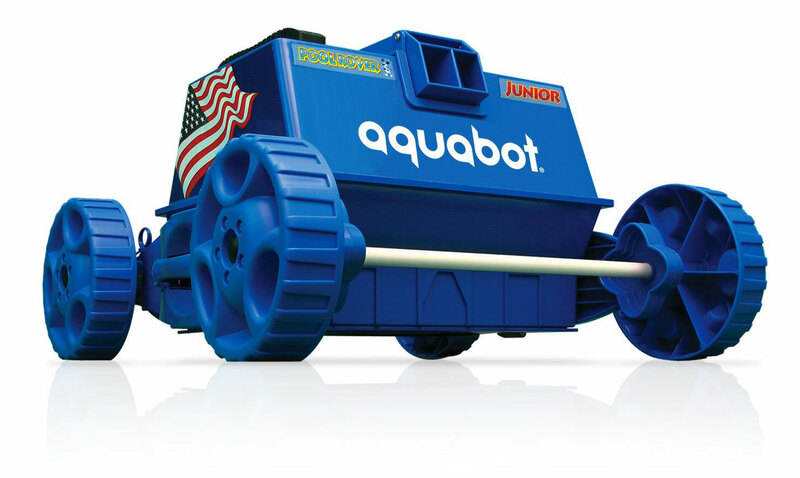 If you really want to avoid getting sick from contaminated pools, purchase the Aquabot Junior in-ground robotic pool cleaner. Designed to scrub and micro-filter dirt and contaminants from your pool, this is one of the best in ground pool cleaners. What’s also great about this unit is that it comes with a plug-and-play option, a 4-hour cleaning cycle, or the capacity to run continuously. But it doesn’t stop there. Another benefit to owning this unit is that it can clean floors and walls in about 2-3 hours and has a powerful filtration system that can suction everything from microscopic particles to big leaves. As an addition to the multitude of useful features in this cleaner, the machine is also energy efficient. The Hawyward RC9742 not only comes with an easy to use caddy, but also has an easy access container that allows you to quickly remove cartridges. Turn this machine on and, within a short two-hour period, you’ll have sparkling pool. This is the best pool cleaner (1000) if you’re looking for an extremely energy efficient model. The Hawyward RC9742 will hardly make a dent on your electricity bill. What’s more, this product works like a charm on vinyl pools and might just be the best robotic pool cleaner for vinyl pools. 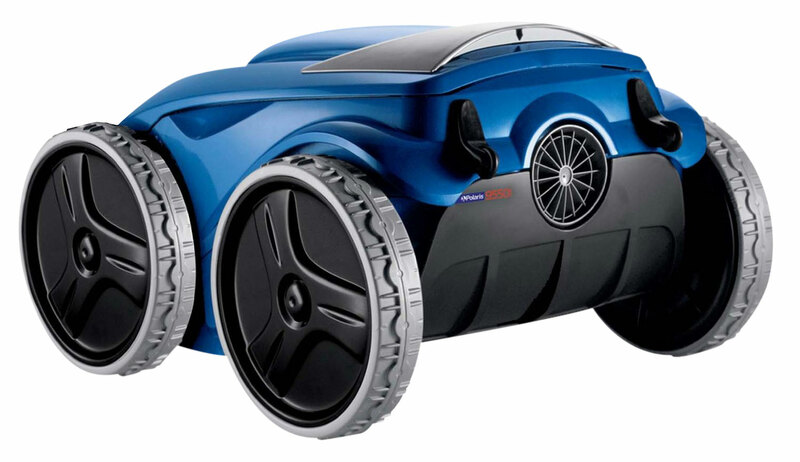 Although it might look like a toy racecar, the Zodiac Polaris 350 Sport Robotic In-ground pool cleaner is actually the best robotic pool cleaner 2016. 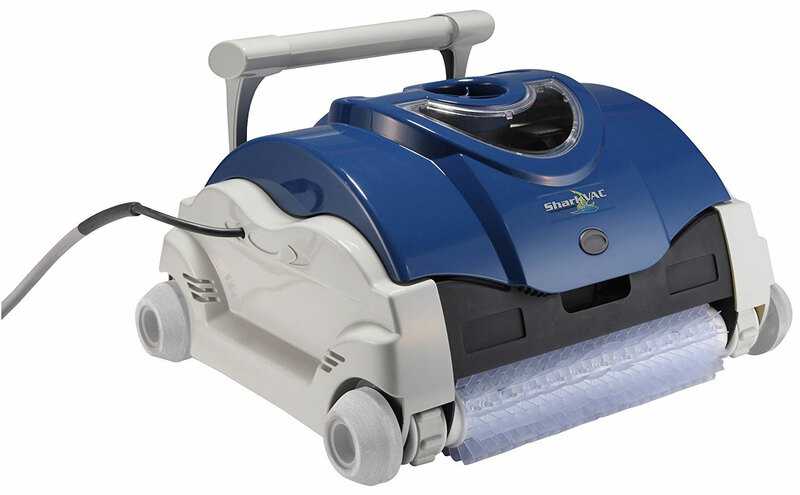 With seven different cleaning cycles that you can program, an easy to operate remote control, and the capacity to clean pool floors and walls, this machine is well worth every penny spent. One of the highlights of this unit is the incredible filter, which can pick up a variety of debris, including small fragments like sand. It also comes with a caddy that makes transporting and storing your pool cleaner complication-free. Another unique feature to this cleaner is its rear propulsion technology, which allows the model to clean in hard to reach areas like under the stairs. 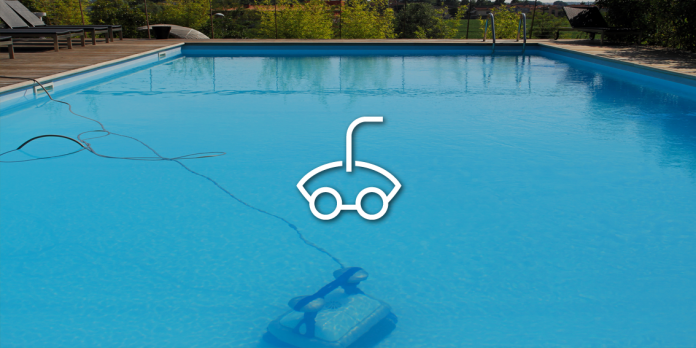 Looking for the pool cleaning robot (880) to cut down on the amount of time you spend cleaning the pool? 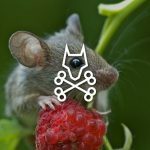 You might just find everything you need in the Aquabot ABTTJET Turbo T Jet. This machine comes with a lot of advantages, such as a two-year product warranty and the ability to replace parts for as little as 50 cents. 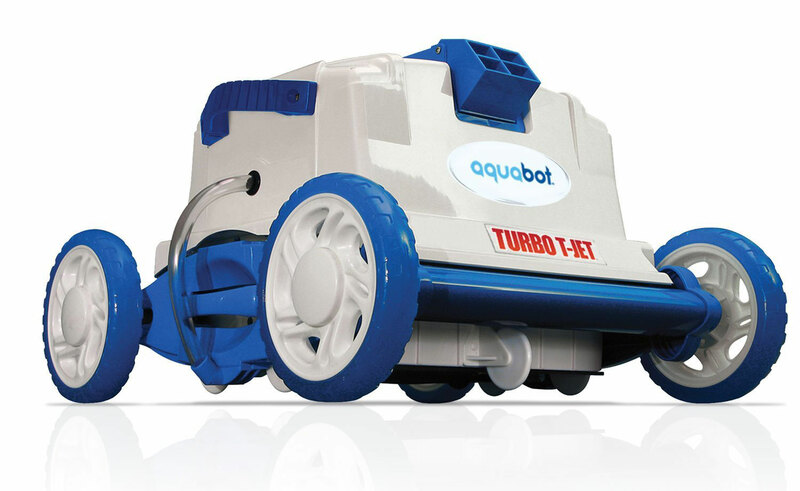 However, the best thing about the Aquabot T Jet pool cleaner is that it pressure washes, an effective technique to have a dazzling pool every time. What’s more, this product doesn’t require excess hoses and also features a 2-hour cycle or a continuous run option. 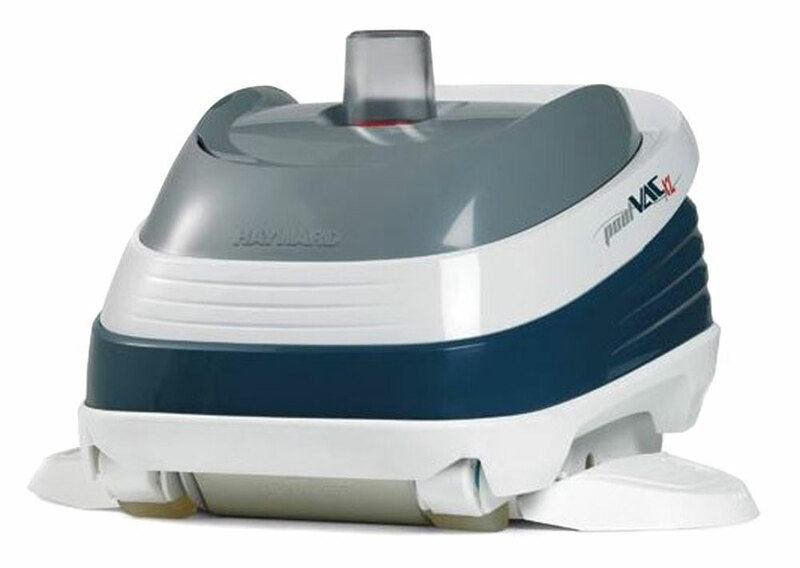 For individuals looking for a great automated pool cleaner that easy on the wallet, consider the Hayward 2025ADV. While it isn’t as high tech as some of the more expensive robotic pool cleaners (720), this is a great tool for anyone on a budget. It’s effective, fast, quiet, and easy to use. Models come predesigned for either concrete or vinyl pools, depending the kind you select upon purchase. 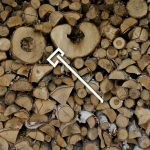 Keep in mind that unlike other models, this product will have a bit of a learning curve. The cheaper price tag does mean you might have to forfeit some convenience features. Also, ensuring that this machine remains long lasting will require some extra maintenance. Keep in mind that this product hooks up to suction port and works using your pool’s existing filtration system. If you can get past some of the quirks, you’ll find that this is one of the best robotic pool cleaners. This model is like a pool cleaner straight from the future. The Aquabot ABREEZ4 X-Large Breeze can clean both backwards and forwards, and also has the capacity to climb up walls or inclines. What’s especially impressive about this unit, however, is how easy it is to clean. With two, easy to access, large buckets located at the top of the pool vacuum, dumping out debris has never been easier. Another reason why this is the best automatic pool cleaner (590) becomes apparent when you examine the way the Aquabot X-Large Breeze cleans. Along with power washing jet streams, the product also features two brushes that are designed to ensure spotless results. The long, 50 foot cable also makes this unit ideal for a variety of different pool types and sizes, including gunite pool surfaces. In the simplest of terms, a robotic pool cleaner is like a vacuum for your pool. They are designed make the process of cleaning pools fast and easy, with little effort required on the user’s part. The best robotic pool cleaners also have the ability to clean the pool walls, floors, coves, and even tiles. Typically, different robotic pool cleaners (720) are designed for specific types of pools. However, you can occasionally find models that are built to accommodate almost every kind. Pool cleaners work by suctioning dirt and debris off the surface of your pool. Many models also feature the ability to scrub down pool floors, walls, coves, and even stairs. Unlike suction side or pressure side cleaners, automatic pool cleaners require the least amount of manual labor. Typically, you simply drop the unit into the water and let it run. It’s that simple! Automated pool vacuums can filter out particles and contaminants in the pool as well. How a pool cleaner operates can vary on the type. Some models will require extra hoses and hook ups to get the job done, while others are completely self-contained. In general, you’ll find that the more expensive products operate completely independently of your filtration system. The biggest benefits to having an automatic pool cleaner is that they save you time and effort. Instead of spending 3 or 4 hours catching debris in a net and then scrubbing the pool, you can simply drop your pool cleaner into the water and let it do the job for you. Take a moment to imagine how many other jobs you could complete while your pool cleaning works on its own. In the usual time that it would take you to simply clean the pool, you could get so many other projects accomplished. It also eliminates the feeling of despair that can wash over you when you turn your back for a few seconds only to find an abundance of fallen leaves, pollen, and other debris into your clean pool. Instead, you can rest assured knowing that when the situation arises you can depend on your pool cleaner to do all the work. If you have an above ground pool and want to find the best automatic pool cleaner (590) for it, you can’t go wrong with the Aquabot APRVJR Pool Rover Above-Ground Pool Cleaner. The easy operation and powerful motor on this product will help you to maintain a flawless above ground pool. 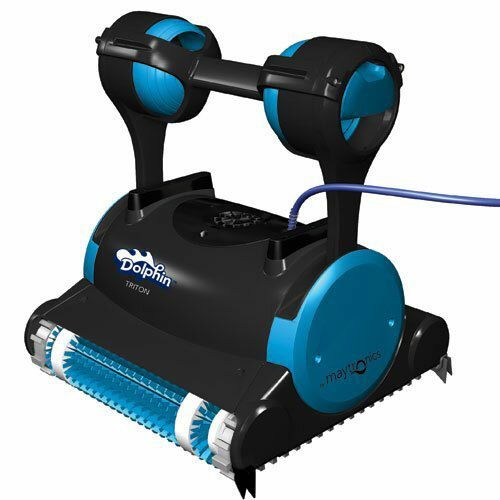 Developed with a plan to tackle all kinds of debris, the Dolphin Nautilus Robotic Pool Cleaner is the best pool cleaner for large debris. This unit comes with two different screens; one designed to pick up fine particles, and the other created to pick up a wide range of debris. The Aquabot Junior In-Ground Robotic Pool Cleaner does a phenomenal job of picking up leaves of all shapes and sizes, making it the best robotic pool cleaner for leaves. Everyone wants to enjoy an immaculate pool. However, it can be hard to enjoy your pool if you spend more time cleaning it than you do relaxing in it. If you want to save yourself a lot of backaches, headaches, and heartaches, purchase a pool cleaning robot (880). Since these machines are designed to eliminate hassle and save time, you’re bound to have more free time to do the things you’d like. If you’d like to do more research to determine what the best pool cleaner (1000) for you might be, check out some of the pool cleaner reviews consumer reports. Remember, the benefits you’ll reap from purchasing a pool cleaner will go towards helping you progress on other home improvement projects.